Need a quick escape from all of Saratoga’s fabulousness? For those of us who crave a first-rate spa and wellness experience, look no further than Albany. In just over a half-hour you could be wrapped in a fluffy robe, lost in a world-class spa facility. How nice does that sound? Since I’ve been fortunate enough to travel around the planet and experienced some of its very best spas, I’m pretty jaded about spas and even more snarky about peoples’ idea of what a “real spa” is. Labeled a “day spa,” Spa Mirbeau confesses to being more of a “day resort,” and I couldn’t agree more. Even by my judgy standards, this spa’s impressive entrance; large, well-appointed locker room; and well-designed changing areas, with relaxtion pavilions and firepits, plus generous refreshments and hydrators, immediately had me convinced: Spa Mirbeau is crazy legit. The rooms housing the massaging-mani/pedi stations sealed the deal. This spa is modern, super-clean, elegant…and even man-friendly! Want more surprising truth bombs? Spa Mirbeau is the closest thing to the famed Canyon Ranch spa and resort you’re going to get north of Manhattan. This top-notch retreat is not just a state-of-the-art, 17,000-square-foot facility, it’s also the de facto wellness club near our state capital’s government offices, serving the upscale heavyweights and social patrons who make up the power lunch fabric of this bustling Upsate New York destination. 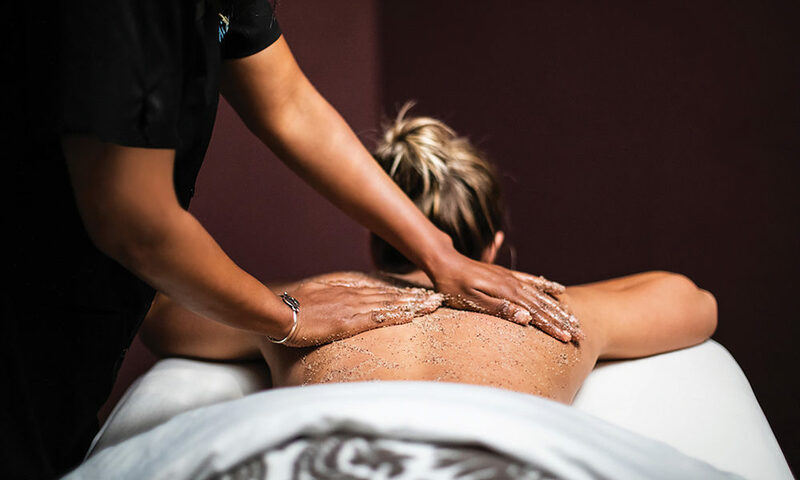 With some 14 treatment rooms, with fireplaces and private sound systems, and herbal-infused steam rooms and saunas, you’ll know Spa Mirbeau doesn’t take the term “treatment” lightly. That seriousness of purpose has also inspired a coveted signature body-product line. All of their facials are executed in expertly designed steps, with specific serums, masks and gentle devices designed to achieve maximum effect. Consider the Premier Cru Facial, utilizing Caudalie’s tri-patented active ingredients; or the Intraceutical Advanced Lift Facial, with your choice of an Antioxidant, Vitamin A, Vitamin C+3 or Collagen booster treatments, which infuses into your dermal layers for fast, noticeable, red-carpet-worthy results. Offering brands such as Caudalie and Intraceutical, the spa’s La Boutique is the ideal place to get guidance for some new skincare products to help prolong your youthful glow at home. If you’re tired, overwhelmed, stressed or sore from winter sports, the spa has a cure for whatever ails you; the massage menu is thorough and magical. Here are my top three massage recommendations (very indulgent, I realize): the Monet’s Favorite Fragrance Massage (aromatherapy), Deep Tissue and Himalayan Salt Stone Massage. You could extend the pampering by arranging for a quasi-staycation in an Albany hotel and make a whole wellness intervention weekend of it. Or just get a mani-pedi, secure a complimentary day pass and make use of the enormous exercise facility. Then, top the day off by having a steam and delish spa lunch or dinner at Le Bistro & Wine Bar on Spa Mirbeau’s Aqua Terrace level. Better still? Stay in your robe or jump into the resort’s jetted, mini, hot massage pool—and invite a friend to have a drink, share some small plates or full-on cuisine and dessert right there in the water! I strongly recommend that you take the spa’s virtual tour on its website. All the possibilities for a satisfying day of “you time” will become crystal clear. Not to be underestimated, Spa Mirbeau’s brand is based on fine hospitality, with a fully sanctioned hotel resort experience available now in Skaneateles (in the Finger Lakes) and coming this fall to Rhinebeck, NY—and I must say, it’s looking nothing short of spectacular. Get on board, my fellow Saratogians, and namaste your cares away. Spa Mirbeau is a world class facility right here in your own backyard. You don’t find that every day, now, do you?